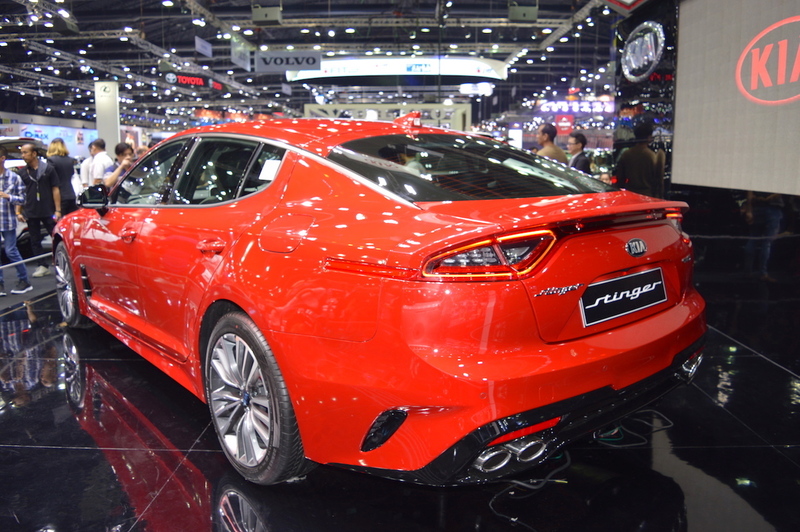 Kia launched the Kia Stinger in Thailand at the 2017 Thai Motor Expo that opened on 29 November, 2017. Here are images of the car from the event. The Kia Stinger is the production version of the 2011 Kia GT Concept and competes with sports sedans like the BMW 3 Series. The flagship Kia rides on a brand new RWD platform that also underpins the Genesis G70. The fastback sedan is 4,830 mm long, 1,870 mm wide and 1,400 mm tall. It has a 2,905 mm wheelbase. The Kia Stinger seen in the images is in the GT-Line grade. On the outside, Kia has equipped the Stinger GT-Line with LED headlights with DRLs and nine crystal turn signals, exclusive Black & Chrome 'Schreyer' grille surround, hood vents, 19-inch alloy wheels, black gloss fender garnish, dark chrome finish ORVMs, LED rear combination lamps and chrome coated quad-exhaust tips. Flat-bottom, perforated leather sports steering wheel with GT-Line logo, 7-inch driver information display, colour head-up display, alloy sports pedals, ventilated and heated front seats, alloy scuff plates and a Harman/Kardon sound system consisting of 8 speakers, 4 tweeters, centre speaker and 2 under seat subwoofers are among the Kia Stinger GT-Line’s interior highlights. The pictured Kia Stinger GT-Line employs the 2.0-litre T-GDi petrol engine that produces 247 PS and 353 Nm of torque. Subject to market availability, there is an option for the 2.2-litre CRDi diesel engine that develops 200 PS and 440 Nm of torque. An 8-speed automatic transmission is standard. 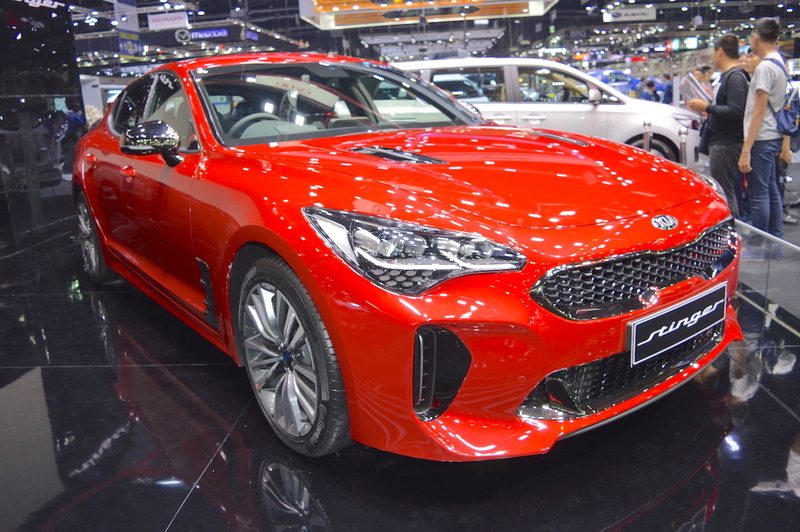 The Kia Stinger GT-Line 2.0 T-GDi retails at 2.99 million Baht (INR 59,01,064.00) in Thailand.